The South American nation's offshore oil formations may be cost-competitive with American shale -- for now. The crash in crude oil prices and subsequent stabilization at or under $50 per barrel has made efficiency the name of the game in oil production. Non-core assets were sold, new megaprojects have been few and far between, and breakeven costs for existing assets have been driven down as quickly as possible. Current oil prices haven't been kind to new offshore and deepwater oil production, which is among the most expensive to develop in the industry. Well, perhaps with the exception of Brazil. About 10 years ago, South America's shining economic star discovered tens of billions of barrels of oil in the pre-salt formations offshore its southeastern coast. In 2013, it discovered over 1 billion more about 1,000 miles north. Some estimates put the total at over 30 billion barrels. If early production is any key, then Brazil's offshore oil could be extracted profitably at $40 per barrel or lower. That would be a major boon to the state-owned oil giant Petrobras (NYSE:PBR), which is staking much of its future growth to developing new offshore oil assets at the same time peers have generally run in the opposite direction. However, success depends heavily on attracting the financial and technical help of international partners. And nothing comes easy in Brazil. Petrobras has long figured that pre-salt oil would be pretty competitive in the global markets. Late last year, the company admitted to Bloomberg that higher-than-expected production volumes from initial platforms pushed the break-even cost to just $40 per barrel. Not only was that on roughly on par with American shale oil at the time, but management expects the number could head even lower. Increased offshore production is expected to boost the state-owned oil company's output 34% to 2.77 million barrels of oil equivalent per day (boe/d) by 2021. Offshore production comprises some 40% of the company's total liquids output today. Central to achieving that goal is bringing in outside investment from oil majors with the capital and expertise to develop the fields profitably. While Brazil's federal government has historically kept close watch over its oil and economic development, it has recently begun to loosen its grip and roll out the welcome mat to the competition. A piece of legislation passed in late 2016 will relieve Petrobras' obligations to own 30% of any joint venture in the country and become a primary operator. Meanwhile, the government has proposed steep reductions in local content requirements (the amount of goods and services that must be purchased within the country, from bolts to platform hulls) and simplified the categories to which they're applied. Both moves should allow Petrobras to be more strategic about development in the country, which will be key to managing and lowering its $100 billion-plus debt load. Investors may get their first glimpse of increased competition this September when the next competitive bidding round is set to take place. What can they expect? 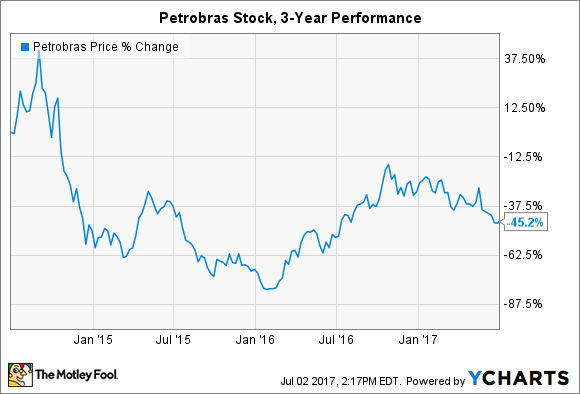 Well, last summer Petrobras sold 66% of its operating interest in a large pre-salt deposit to Statoil (NYSE:EQNR) for $2.5 billion. The two followed that up with a memorandum of understanding to explore ways to strengthen their partnership in the future. They're already partners in 10 blocks domestically that are either in development or production. Statoil is hardly alone. Many other oil producers are eyeing Brazil as a source of low-cost oil and a way to diversify their holdings. Months after selling development rights to Statoil, Petrobras announced a $2.2 billion asset sale to Total SA (NYSE:TOT). The French energy giant gained a 22.5% and 35% stake in two fields in the pre-salt Santos Basin and will assume operator responsibilities for the latter. Meanwhile, Royal Dutch Shell (NYSE:RDS-A) is well positioned in the country after acquiring BG Group for $52 billion. The move made the company the second-leading oil producer in Brazil behind Petrobras, with 240,000 boe/d in early 2016, which is roughly 13% of the European energy giant's total global output. That's impressive, but it's far from over. Royal Dutch Shell expects its production in Brazil to quadruple to approximately 1 million boe/d by 2020. The company owns 20% of the costs and eventual rewards for developing the massive Libra field, which could hold 12 billion barrels of oil. The Brazilian government estimates it could cost up to $40 billion to develop. However, Shell hasn't blinked yet, partly because it's also eyeing the field for its natural gas deposits as it looks to grow its liquefied natural gas business. It may not be on investors' radars, but things are about to heat up in Brazil's offshore oil deposits. While offshore exploration and services have been absolutely obliterated around the world in recent years, investors shouldn't be too worried if they see the words "offshore oil" pop up more frequently in the second half of 2017. Many major oil companies are looking to take advantage of a more open and more competitive Brazil. If they're correct in their assessments, then they could gain a hold of deepwater oil that's actually cheap. Why Does Wall Street Love This Controversial Oil Stock?